I know I haven't been active lately... I'm very absorbed with my work nowadays, but I'm also updating my tumblr a lot. Check it out for some sketches from me! A surprisingly quick painting of Ariel. One of the frames from the movie was so charming that I just had to do something more with it than just a sketch. Took about two hours. I know I screwed up the water, I know. This is good, this is DAMN good! Moja ulubiona księżniczka Disneya. Fajne przedstawienie włosów. Will you consider adding this to your society6 account so people can order it as a print/mug/tshirt/phonecase etc? this is stunning! she is looking really seductive. I loved the way you have done her hair!! have you ever created a tutorial? I love this! Is this an actual drawing or is it digital art? I really can't tell. This is wonderful! Lovely work. This is absolutely beautiful. 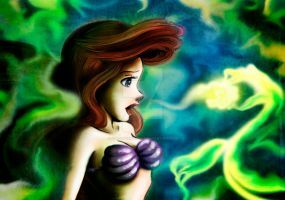 The effect of only showing her eyes is that you depict a seemingly coy, curious Ariel. Well done! I actually prefer angels to mermaids, but I still love this pic, especially her eyes. I also love the background and the water. WOW that looks great, Anako !!! I added it to my group ! beautiful colours and depth here!